There is nothing more depressing and frightening to a pet owner than to know that your beloved family member is in need of veterinary care (sometime emergency care) and you can’t afford it. This can sometimes lead to untimely euthanasia or owner surrender of a pet to a rescue because of the inability to pay for treatment. No one should ever have to give up a pet or worse put it down just because of money. But then there is REALITY. Well, now there are much-needed options for those in need! Several organizations provide funds for financially strapped pet owners to help with or cover all of a family pet’s medical needs. PLEASE BOOKMARK THIS POST – you or a friend may be in need of these services at some point in your pet’s lifetime and you will want to have this list handy! Read more about veterinary financial assistance for struggling pet owners here. For an comprehensive list of resources, check out our Pet Related Financial Assistance page. I’ve been an app-junkie ever since getting my first iPhone back in 2010. I’ve downloaded and tried out more than 700 apps to date. My husband says that I need a 12-step program for my “app-diction.” So, when I saw this article published on Mashable – 10 Must-Have Apps for Dog Owners – how could I not share it??? While I am delighted to see Petoxins from the ASPCA listed on here, I do have to say the author has been a bit negligent in not also having ICE for Pets on here too. Whether you frequently travel in the car with your pet(s) or just take them out for a walk, when do you not also have your phone with you?? So, if you should be incapacitated and an emergency worker grabs your phone to look for your ICE (In Case of Emergency) info – shouldn’t they also have access to your pet’s info? What if you were involved in a car accident and both you and your pet were injured? So, if you do nothing else – download this app and fill in the information!! Place it on your home screen in the top left corner (just to the right of your ICE info). It’s available for free in the iTunes App Store & on Google Play. 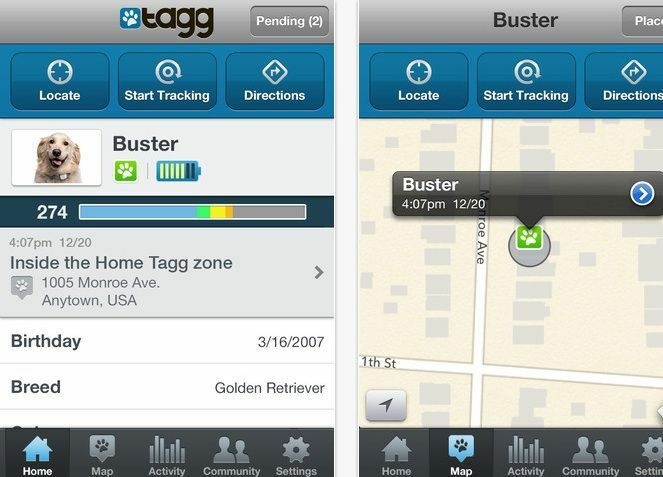 Tagg is essentially a GPS attachment for your dog’s collar, and because of its many features, it can give you peace of mind. The app will track your dog’s activity and send you a message if he goes beyond the boundaries you set. Not only that, Tagg allows you to make sure your dog is getting enough exercise by measuring movement. Available on iOS and Android . 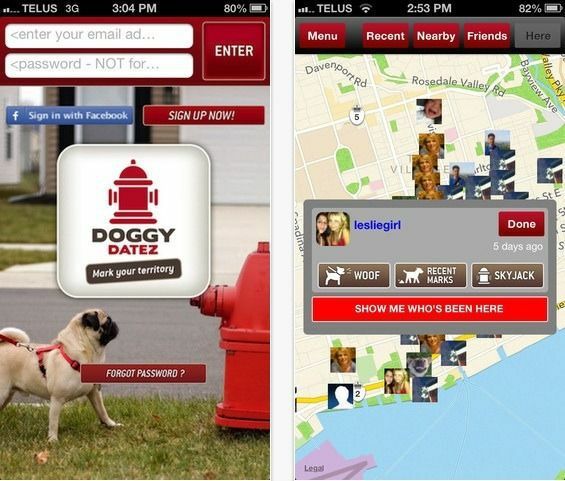 DoggyDatez is a mobile social platform for dog owners and their dogs to make friends. The main idea is that you can “mark your territory” and see who else visits your spot. You’re also able to search for other DoggyDatez users by gender, age, dog gender, dog age and/or dog breed. 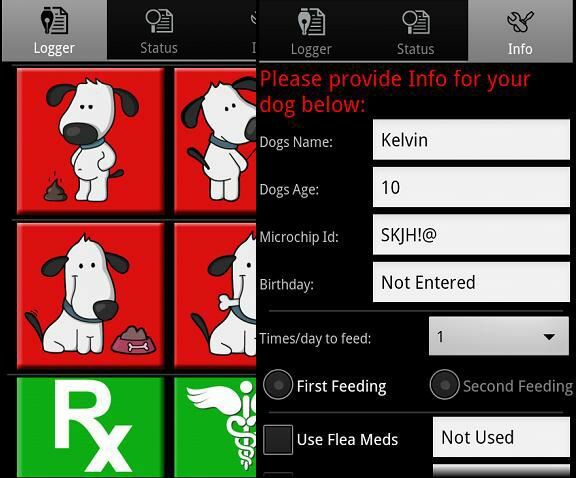 The Pet Phone app lets you track your dog’s health with ease. 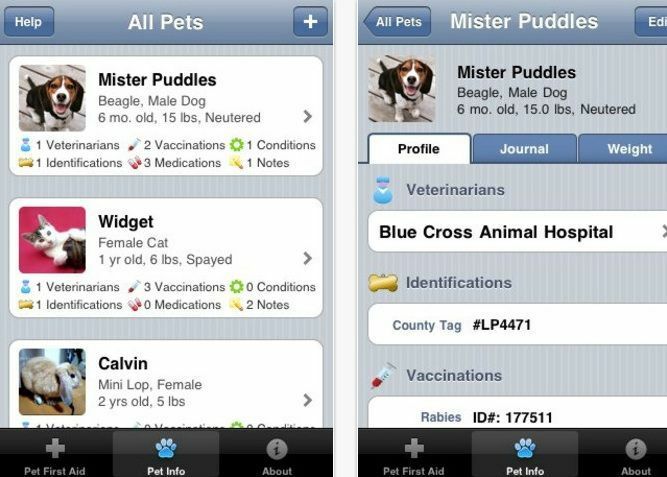 You can keep track of vet appointments, medications, allergies and food preferences for each of your pets, and the app can be synced with your calendar to get reminders. 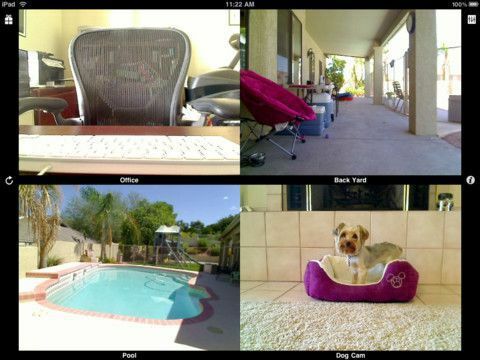 If you want to see what your dog is up to in real-time, iCam is the app to get. You can watch your canine friend remotely, just to make sure everything’s all right. This is especially useful if you’re leaving your dog home for the first time, you recently moved or you’re traveling. It’s tough, if not impossible, to know everything that is harmful to your dog. 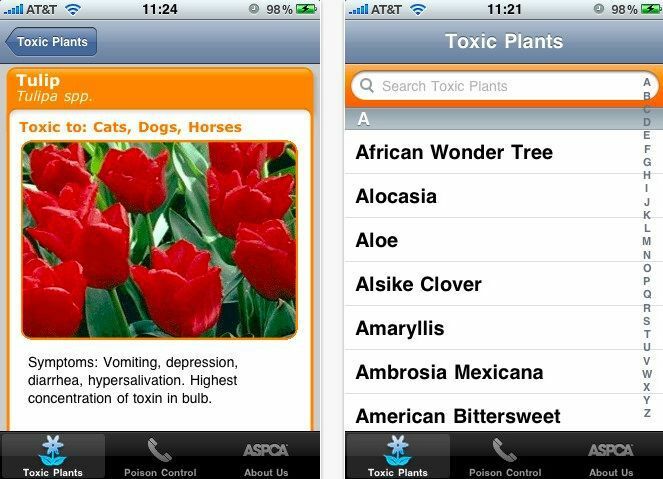 The Petoxins app from the ASPCA helps you out by having a impressive list of poisonous plants, and most of them you probably didn’t know. For example, did you know that tulip bulbs are hazardous? Now you can keep similar vegetation out of your dog’s reach. 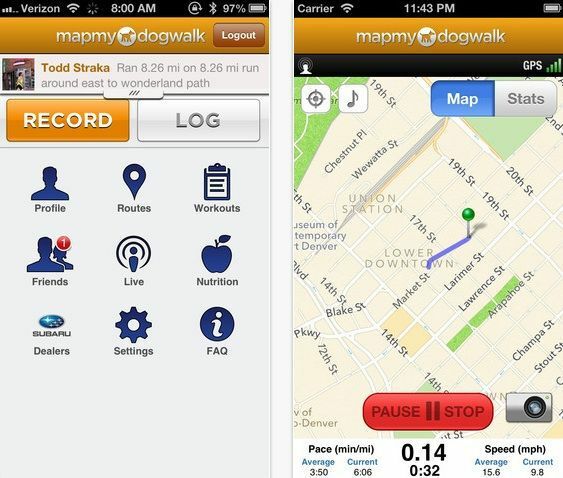 With MapMyDogwalk, you and your dog can get fit at the same time. You can log your walks, track your calories and map your favorite routes using GPS. 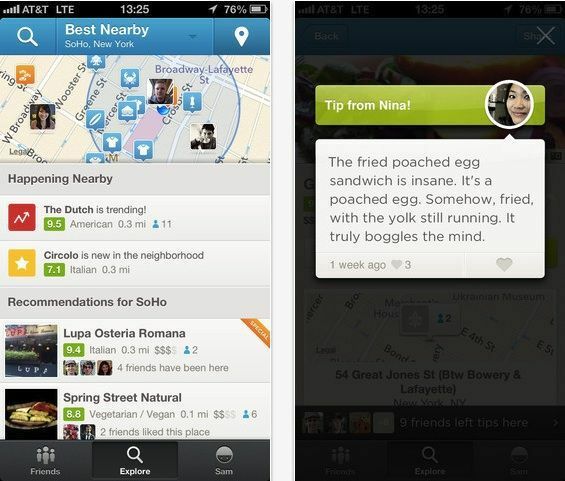 The app also has sharing and geotagging features for photos and data. Raising pets is fun, but it’s also a big responsibility, which means there can be some scares. If anything should happen to your dog, Pet First Aid helps you take the right steps to make sure he’ll be OK. Detailed videos and illustrations include restraint, muzzling, CPR, bandaging and more. Pet Minder Pro helps you keep track of your dog’s actions, and it’s presented in an easy way so you can use it while interacting with your dog. By tapping custom buttons, you’ll never forget when you last gave your dog medicine, fed him, took him for a walk or took him to a play date. You can also track training phases for puppies, set up reminders and share information via notifications. Available on Android . 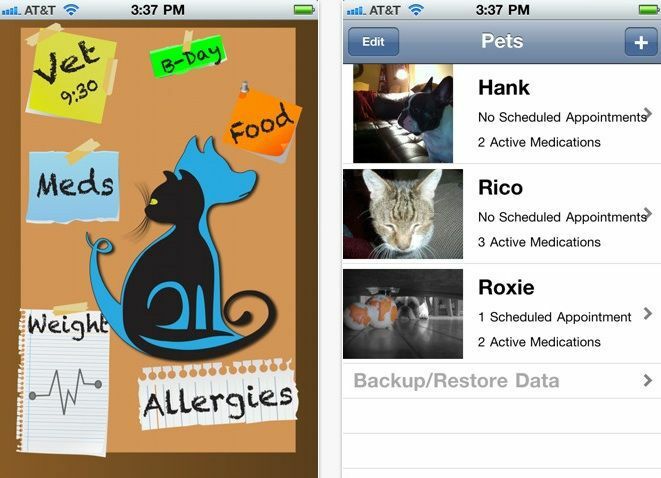 For an iOS alternative, check out MyPetMinder . Answering the question “What kind of dog is he?” isn’t always easy, especially if your dog is a rescue or mix. As a tool, Petsie Dog Breeds can help you figure it out, but it’s also full of adorable photos and information. You can even use it as a fun social network by creating a profile for your dog. Available on Android . 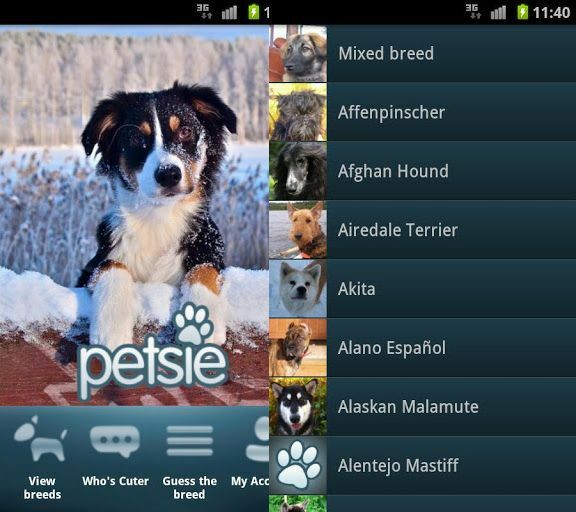 For an iOS alternative, check out Guide to Dog Breeds . It’s useful to check the weather before you take your dog out for a walk, but Weather Puppy takes it to a new (and very cute) level. The app shows more than 100 dogs depending on the time and weather, and you can even add a pic of your own dog. Weather Puppy partners with non-profits and shelters across the U.S. Available on iOS and coming soon on Android. 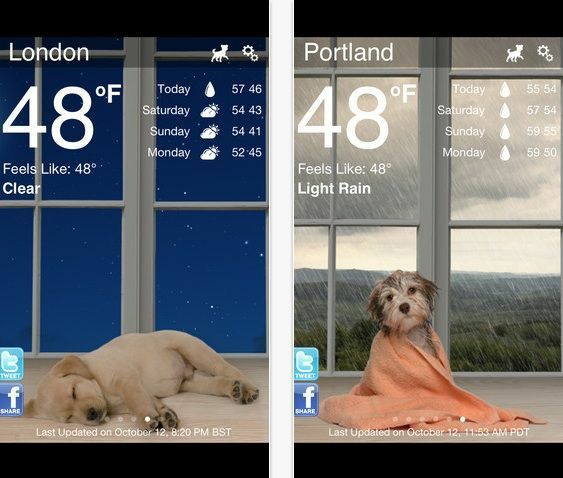 In the meantime, a good Android alternative is Weather Dog . This might seem like an obvious one, but it really comes in handy for dog owners. You can organize all of the dog parks in your city, find nearby pet stores and vets when you need them and see if any friends with dogs are in your area. Available on iOS , Android and BlackBerry App World . How could we not pass this one on?? Thanks to ReadWriteWeb for this great article! You won’t find dog-walking robots here, but there are plenty of other technologies pet lovers should, well, love. For humans, there’s Fitbit. For dogs, there’s Whistle , a sleek fitness monitor that attaches to your canine’s collar. Whistle tracks activities like walks, playtime, sleep and even swims (yes, it’s waterproof). Whistle can even track who your dog has been hanging out with (friends or family, for instance). As with human activity trackers, you can set goals and easily view activity in a sleek dashboard. If your dog exhibits any behavioral changes, Whistle can alert you so you can check it out. Another great feature? The ability to auto-generate reports for your vet. Petcube , currently a Kickstarter project that looks to have an excellent chance of reaching its funding goal, consists of three awesome components: a wide-angle HD camera, a microphone and speakers and, of course, a laser pointer. This means that while the cat—in this case, the human, meaning you—is away, the mice (your cats or dogs) will play. So will the cat. I mean, you. Unlike that previous paragraph, the Petcube makes a lot of sense. I’m always curious what my pets do when I’m gone. Now I can see for myself and share the best photos and videos of my pet’s shenanigans online. PetziConnect , which blew past its own crowdfunding goal on Indiegogo, has many similarities to the Petcube. It can take HD photos and videos of your animals and it will let you have a conversation (inasmuch as that is possible) with your pet via two-way audio. The biggest difference here is that the PetziConnect forgoes a laser pointer for a treat dispenser. Additionally, the PetziConnect plugs directly into a wall outlet, so it isn’t as mobile as the Petcube. Which one is the best fit for you may depend on what excites your pet the most: chasing a red dot or receiving a treat. If you are still using a regular old “dumb” pet tag, it’s time to get with the times. The PetHub embeds a QR code on the back of a normal metal engraved dog tag that others can scan should they find your lost pet. Here’s what’s cool: when a person scans your pet’s tag with their phone, it will display your pet’s profile and information—plus, and this is the great part, it’ll immediately notify you, too. Perhaps this will help cut down on pet piracy (finding someone’s lost pet and not returning it). I mean, who can resist scanning a QR code on a pet tag to see what you might learn? DogVacay is like Airbnb, but for dogs. Next time you leave town and need someone to watch your pooch for awhile, don’t just drop Fido off at the nearest kennel. Instead, browse hosts online, read reviews, pick the perfect place, schedule it andhit the road with peace of mind. That last part is important, and DogVacay takes it seriously by hand-approving all sitters (because even humans need to get vetted) and offering comprehensive protection. Additionally, each host must pass an online training course, for what it’s worth. Does your usual boarding location offer a 100% guarantee? On May 5, 2013, as part of the 35th Annual Point-to-Point Race, PAWS Training Centers will be hosting a fun-filled, fido-focused festival at the “Canine Capers” tent. A tradition at Point-to-Point, Canine Capers will prove to be a destination spot at this year’s event – conveniently located just past the Winterthur Hunt tent. This is the one and only day you can bring your dog to Winterthur! PAWS for People is this year’s Canine Capers non-profit partner. PAWS for People, a Delaware-based regional pet therapy organization, lovingly provides elders, children, and folks with disabilities individualized, therapeutic visits with a gentle affectionate pet. All well-behaved leashed dogs, accompanied by their owners, are welcome at the Canine Capers tent. Canine Capers is generously supported by the following organizations and many more! Naki’o is truly the bionic dog: Thanks to MedicalDaily.com for pickig up this incredible news story – a story of hope and survival and the special bond between human & canine. A mixed-breed dog who lost his four paws after being stricken with frostbite has been given a second chance at living a normal life with his new prosthetic paws. Naki’o was rescued as a pup after his former owners abandoned him in a foreclosed Nebraska home. Naki’o, a mixed-breed dog with four prosthetic devices, goes for a run in Colorado Springs April 12, 2013. During the winter, rescuers of an animal center found him in a puddle with all four paws and the tip of his tail frozen. Naki’o received full medical attention, but the severe damage from frostbite cost him his paws and left him lame and unable to walk and play. This lowered his chances of finding a new owner. However, a veterinarian assistant Christie Pace from Colorado Springs saw Naki’o needed a new home and life. Without hesitation, she adopted him at 8-weeks-old and began scouting organizations who could help Naki’o walk again. Naki’o, a mixed-breed dog with four prosthetic devices, jumps for a treat in Colorado Springs April 12, 2013. “I have a soft spot for rescue animals in general. I was looking for something different, unique,” Pace told Metro news. So Pace organized a fundraiser with the help of Ortho Pets , a Colorado-based company that specializes in veterinary orthotics and prosthetics, to get rear leg prosthetics fitted for Naki’o. The effort paid off, and they were able to afford prosthetics that cost between $930 and $3,100. Naki’o, a dog with four prosthetic devices shows off one of his legs with the prosthetic and one of his legs without in Colorado Springs April 12, 2013. “When we saw how good he was doing with his back leg prosthetics and how he was struggling to use his front legs it was very simple to say, “we gotta keep with him,”‘ Martin Kaufmann, owner of Orthopets, told Metro. So they fitted two more prosthetics for his front paws. Naki’o’s surgeries went without a glitch. A medical pioneer, he’s believed to be the first “bionic” dog, with prosthetics on all fours. Pace says he’s now able to play and begin living a normal life again. When you have a minute, check out OrthoPets – a company that is changing pets’ lives – and saving them in some cases. Like their Facebook page here and tell some of your fellow pet-lovers about the incredible work they are doing!